Waking up to a cold and chilly Hokkaido morning, looking through the windows from my hotel room, I can spot the rain clouds over the horizon and rain falling down over a part of the sea and coastal area. After a hearty breakfast, having a good mix of local and international cuisines. We checked out and were getting ready to start our Day 2 Photographer Invitation Program schedule. Just as we were loading the luggage and getting into the mini bus, it started snowing! Yes, it was getting colder with the snowing and strong winds!! We all got pretty excited with the snow falling down on us; it’s lovely and magical!! While it was not my first time experiencing snow, I loved playing with the snow!! We started our Day 2 journey by making a quick pit stop at Utoro harbour. 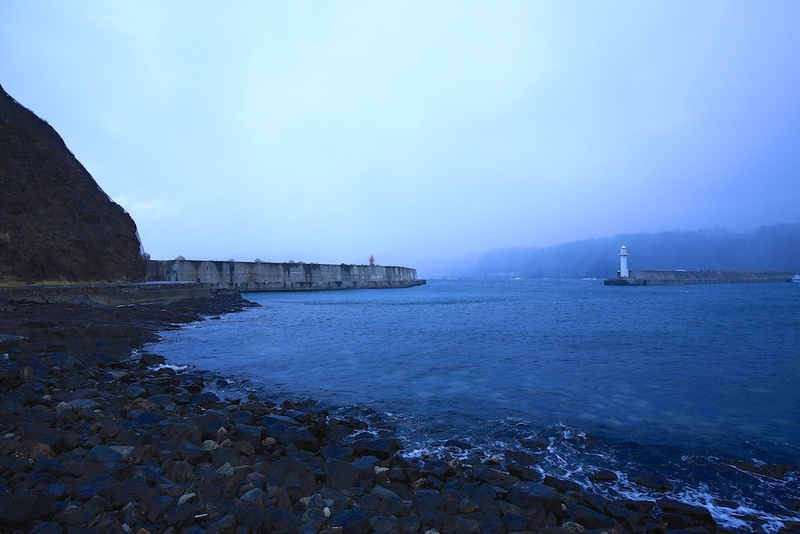 It was snowing and with sea winds blowing, it was cold! Mr. Tsuyoshi Kato was our Professional Japanese Photographer guide (he’s also our photo guide, translator and driver for our entire adventure) for our Day 2 schedule and he was very awesome, he knew when and where to stop for photographers to take photographs because he is a photographer himself! 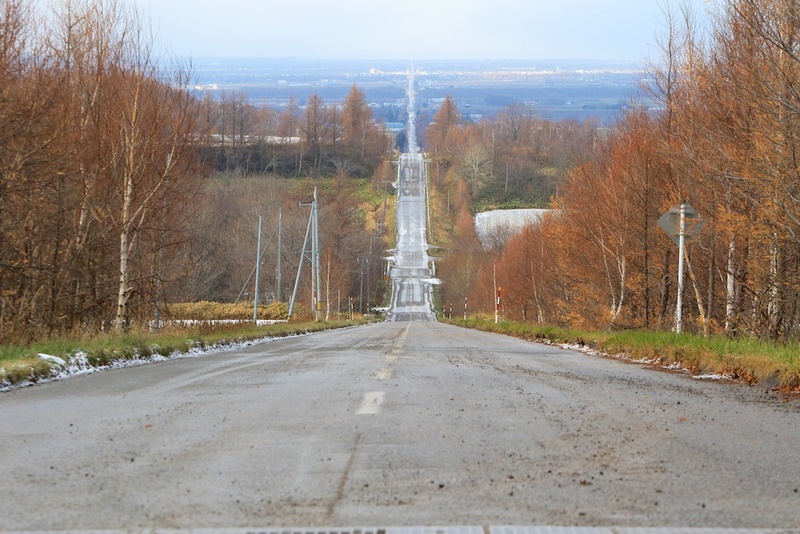 In this area, Shari, Hokkaido, there is a road named “Road to Heaven”. Why is this road so special? Road to Heaven is distinctively Hokkaido, it is the Route 334/244, Shari-cho, Shari Hokkaido, Japan / 17km straight route. The Road to Heaven is straight, with leading lines that ends at the sea. My photographer friend David, who visited Hokkaido before, shared with me about the Road to Heaven, how uniquely it is to Hokkaido and the best time to photograph Road to Heaven is during Autumn (the time that I visited) when the leaves had fallen down and the whole Road to Heaven is very distinct! While we were up there enjoying the top of Road to Heaven, we, the band of photographers had a fun time doing and taking jump shots! As we continued driving along the road to our next stop, Lake Kussharo, we were mesmerized by the snow conditions. Along the road, Mr. Kato-san found a nice spot and stopped his mini-bus, we came down, took photographs of the snow filled landscape on the fields and trees. Mr. Kato-san also built a snowman and we took turns to hold the cute snowman for a photo! I had a fun time playing with the snow! Driving on from Shari to Teshikaga, our next stop was at Lake Kussharo. The road trip was special and unique, on one side of the Hokkaido roads, it was filled with snowfall, while on the other side of the road, and it was autumn colours. The unique natural beauty of Hokkaido, two seasons, autumn and winter side by side. 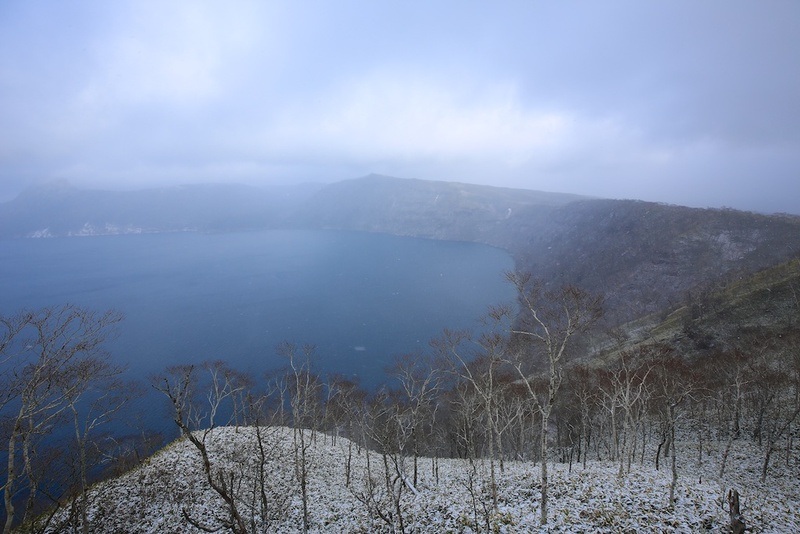 Lake Kussharo is the caldera lake in Akan National Park, upon reaching Lake Kussharo; we can feel the cold autumn/winter weather with strong winds blowing ast us. I wasn’t wearing gloves when taking photographs and it can really be tough on my hands! I recommend photographers to get gloves when visiting countries during winter season! The beautiful and cute swans at Lake Kussharo were pretty friendly and not afraid of human beings! We were pretty close to them and took some close up shots of the swans! 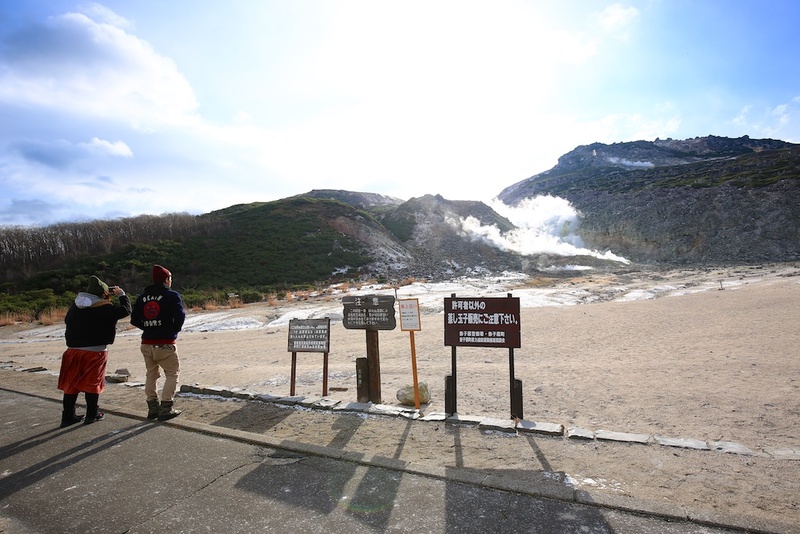 Continuing on with our travel schedule, we departed from Lake Kussharo and drove towards our next stop Mt Iou. It is an active volcano, one of the mountains in Akan National Park. With the smell of sulphur in the air and on the rocks, we spent some time there taking photos at the sulphur rocks with steam coming out from the ground and rocks. 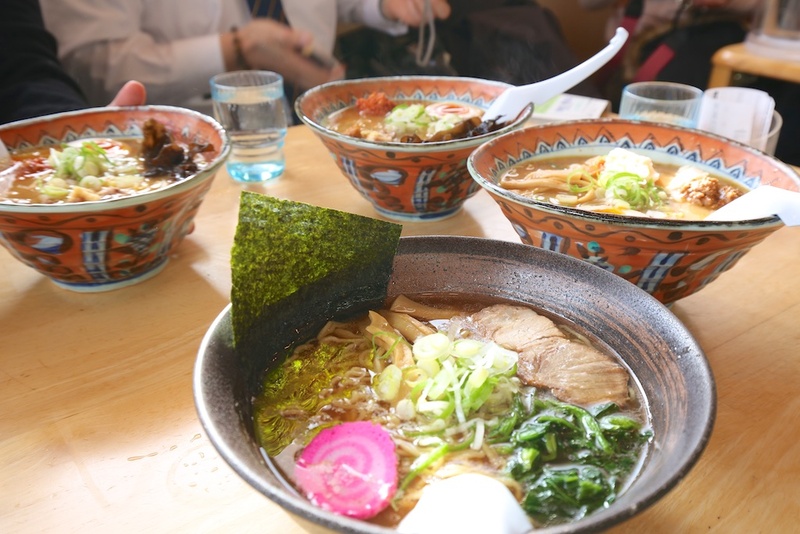 I love Ramen and Teshikaga-Ramen was delicious and tasty! You have to try it if you have the chance! After our tasty and delicious Ramen lunch at Teshikaga-Ramen, we continued with our schedule, traveling up to Lake Mashu. 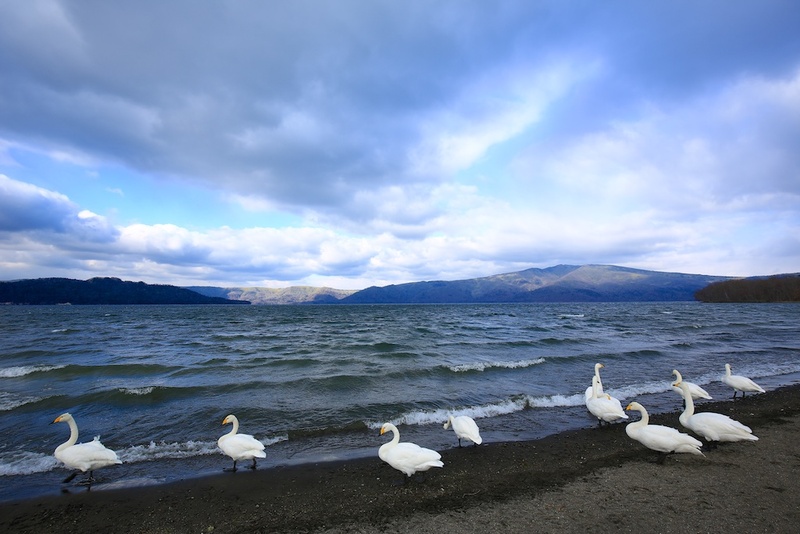 This is similar to Lake Kussharo, Lake Mashu is the caldera lake in Akan National Park and Lake Mashu has the reputation of the cleanest lake in the world. 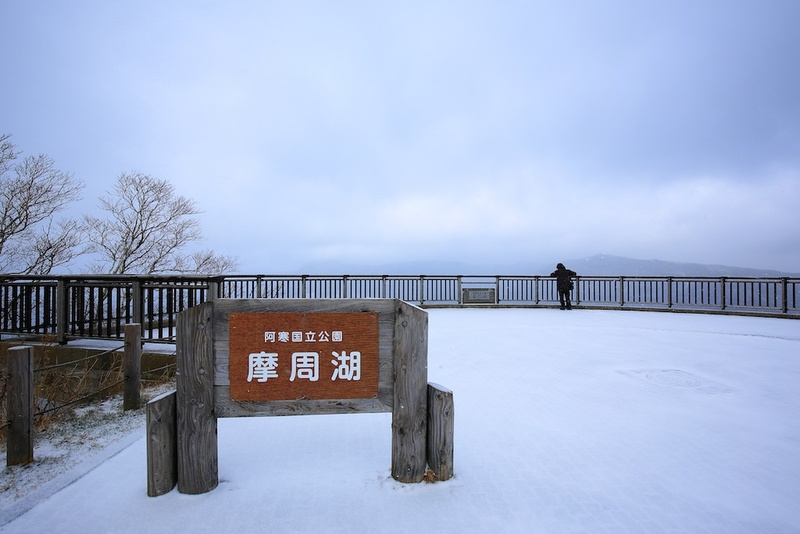 It was snowing at the top of Lake Mashu, snow was covering the tracks, lookout point and visitor centre. It was rather misty due to the weather; nevertheless, we were able to view the beautiful Lake Mashu from the top. 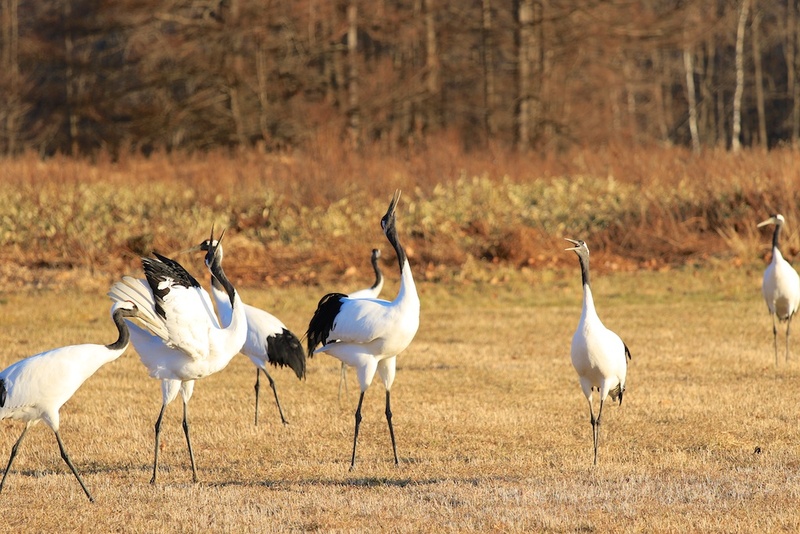 Arriving at Tsurui Village, we visited and stopped by a private park, where the owners reserved it for Japan’s national icon, the red-crown crane, known as the tancho zuru. The birds were given space to rest and feed at the park, away from the human beings. 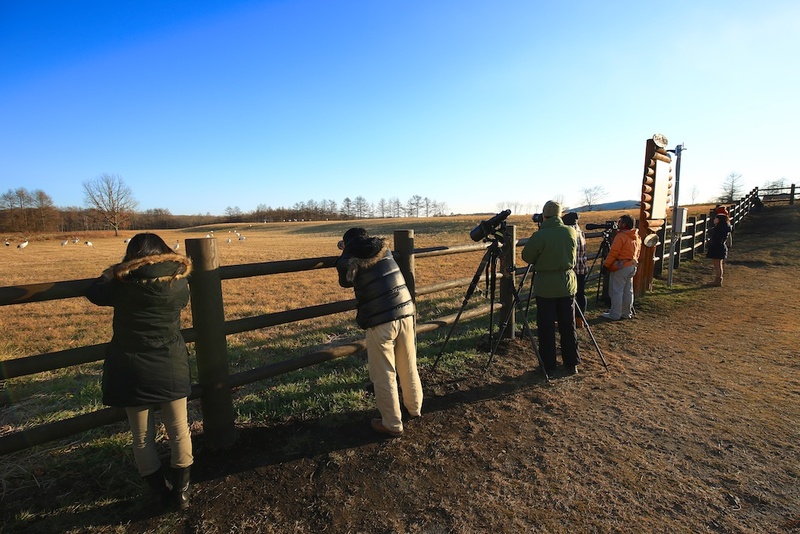 We were able to watch and observe the red-crown cranes from behind a wooden fence. I took out my EF 400mm f5.6 prime lens (Thanks to David for lending me for this trip!) and attached it to the Canon EOS 7D Mark II for bird photography action. It was a pretty good combination; lightweight and portable, ideal for bringing it for travel overseas. With my interest in avian photography, my experiences came in handy and I took a number of shots of the red-crown cranes in action. I was hoping for the cranes in flight, however, luck wasn’t on my side! However, I did manage to get a red-crown crane landing though! We then drove to an open field near the river and was waiting patiently for the red-crown cranes to fly over here during the evening where they will be resting after feeding at other locations. 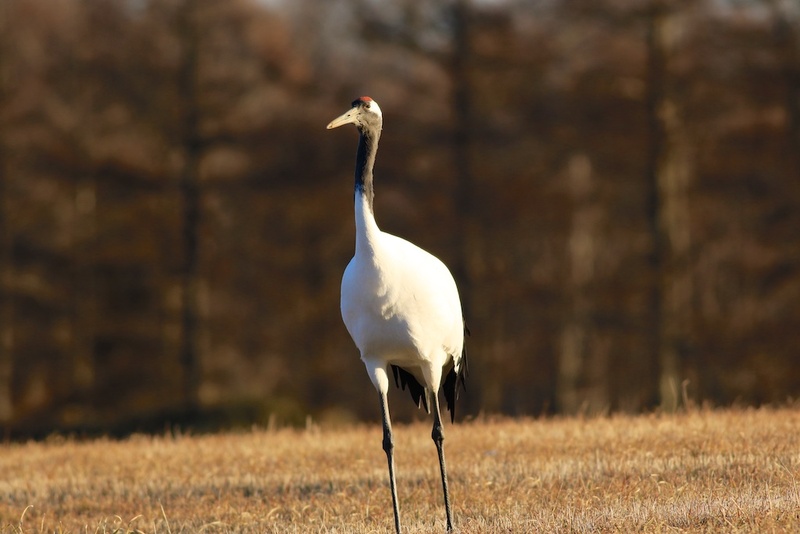 We were not able to spot any of the red-crown cranes in flight and due to sunset and lighting conditions, we had to leave and drive to our next destination, Akankosou, our hotel for the second night. Our hotel for the second night of our travel itinerary, my maiden experience experiencing a traditional Japanese accommodation! This was also my maiden experience with Kaiseki, a traditional Japanese dinner! 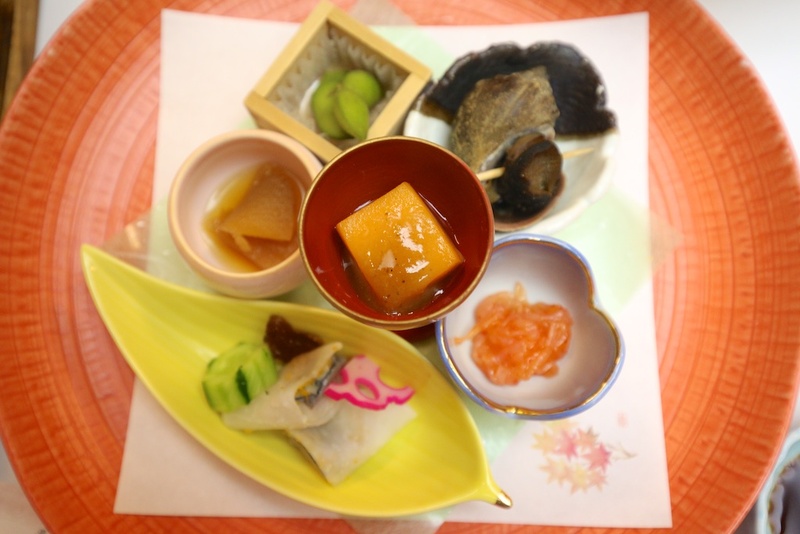 If you have the opportunity to experience Kaiseki in Japan, go for it! The Japanese food dishes that we had during the Kaiseki, it was really awesome, beyond any more words to describe them. Our food photographs and priceless expressions after tasting the food would be the best testimonial to the amazing quality and standards of Japanese cuisine. We were in Food Heaven! Before heading into onsen, we, this band of photographers decided to go out for a night Star Trail/Milky Way shoot (after official itinerary photography outing). Akankosou was kind enough to provide us with a guide and car to bring us out! With their local knowledge experience, the guide brought us to this location known as Mt. Hakuto; 5mins drive from Akankosou, at a height of 950m. When we stepped out of the car and looked up into the Lake Akan night sky, we were immediately blown away by the amount of beautiful shining stars right above us. 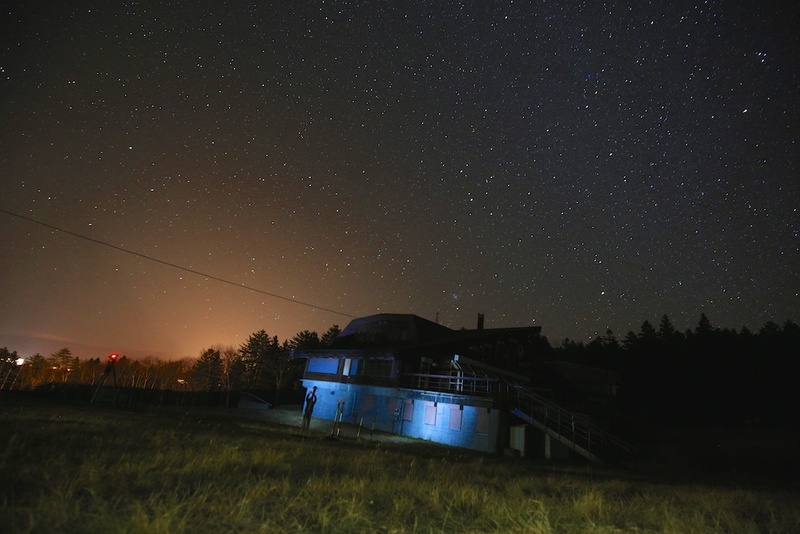 The stars brightened the dark Lake Akan skyline up and it was such a memorable experience for all of us! 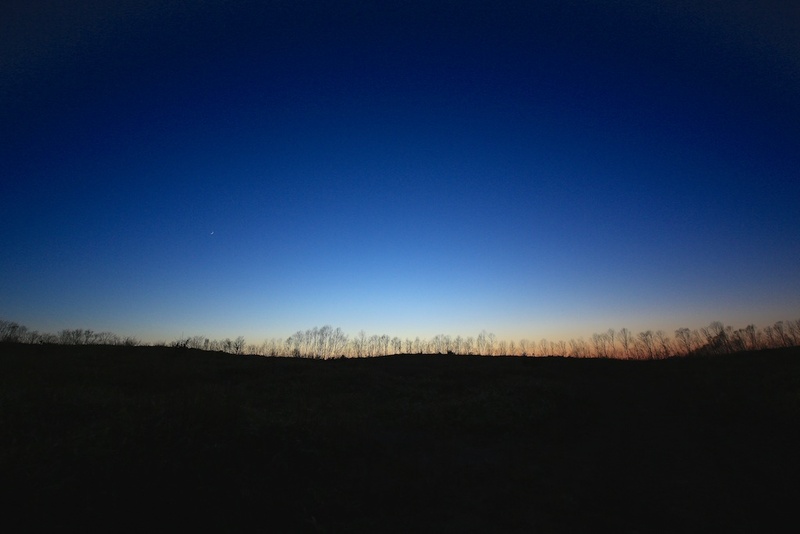 At times, we just wanted to lie down and do star gazing instead of photographing the Star Trails/Milky Way. We played with light painting and long night exposure photography too! 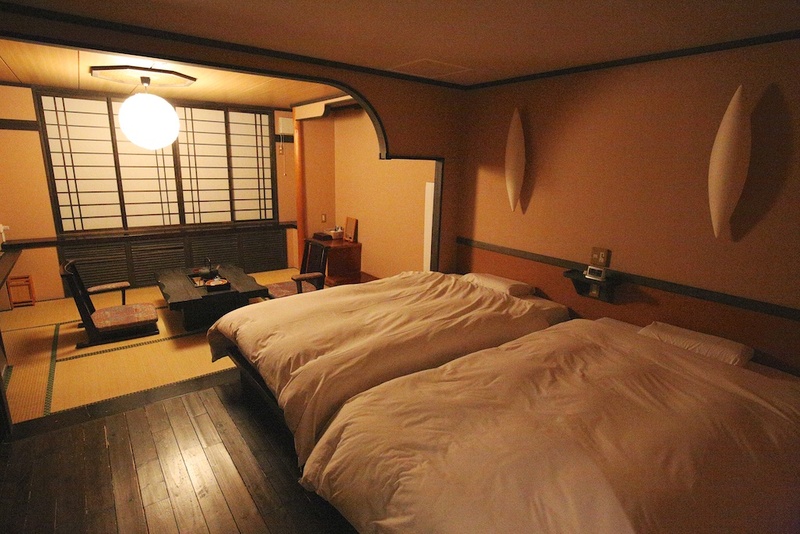 Returning back to our hotel, Akankosou, we went to enjoy the onsen and relax for the night. Day 2 of our travel program had been very fun and it was one of the most memorable travel days out of the 4 days.